Fun day at the park as several Bulls had a terrific game, starting with Jamie Schultz and his 12 K’s, and then there was Richie Shaffer getting his first home run in the 5th inning and another in the 7th. But there was more, a lot more. Jake Goebbert came into the game with an awful OPS of .255 and raised it to .316 with two singles. Still awful, but there’s hope. Similarly, Kyle Roller punched a home run and raised his OPS up to .868, an above average number. 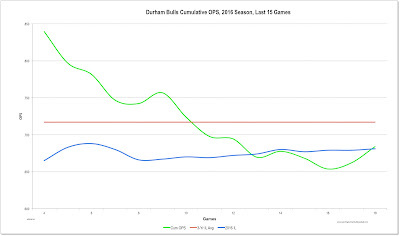 The three homers plus RBIs by Nick Franklin and Carlos Corporan led the Bulls best run differential of the year. Plus they went into a tie for first place in the South Division. In addition to Jamie Shultz’s superb performance, we saw Andrew Bellatti on the mound for the first time since April 13. Did OK in his 22 pitches. Time to call out Eddie Gamboa’s superb ERA of 0.71 and there’s his WHIP of 0.95. He had 2⅓ innings yesterday and looked very good. Blake Snell had a superb start against the Yankees and is back in Durham. The Rays fiddled around with the 40-man roster to add Jhan Marinez and then he was called up. He had an inning in relief last night. No word on his replacement. Possibly Danny Farquar? Luke Maile is reported to be a couple of days away from coming back. No word (that I heard) on Mikie Mahtook’s status. OPS (on base percentage plus slugging) is one of those stats that has fallen out of favor for evaluating individual players. But we are less interested in that than we are in team trends. For that it works just fine. 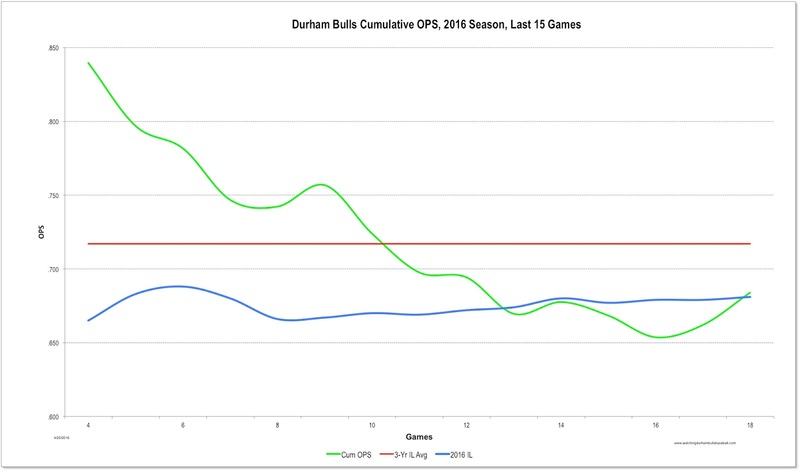 What we see here is that the Bulls’ hitting over the last 15 games fell off from a very hot, small sample start. It fell below this year’s International League average. We are still early enough in the season for one game’s results (the best team OPS of the year — 1.024) to push it up quite a bit.